Check our latest lookbook online! Short clips from our actual shootings around the world. Find the YAKUZA Store next to you. Order vouchers from 25 up to 100 € online. 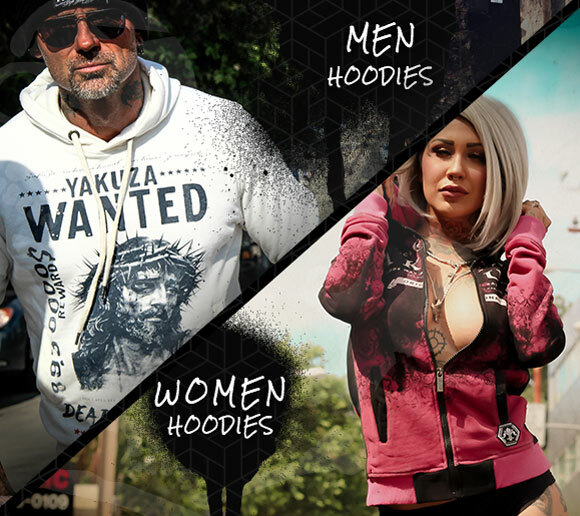 YAKUZA Clothing was founded in 2004 by long time friends, Mick Mark and Bertram. The name YAKUZA is usually associated with the Japanese Mafia and for a couple of tattooed bad boys from East Germany, the name represents a respect for the tradition and integrity of an 800 year old organization. Every major design for Yakuza is based off the original paintings and drawings of Mick, a tattoo artist and the sole designer of this brand. Bertram is the selling arm of the brand. As the ripped tough guy, the villain with a heart of gold, Bertram's image embodies the man that men want to be and need to be at times. YAKUZA is based off of a hard reality, lived by two real men. They built a street wear label out of the back of a van with three hoodie designs and a desire to create an exceptional company that lives up to the dark artistic vision of real lives lived. The manufacturing is done in-house; featuring uncompromising quality with original cut and sew garments made from the most advanced super premium fabrics with 100% original dye sublimation printed and superb construction for durability and fit. YAKUZA Clothing embraces an antisocial ideology that is NOT for everyone - and that is just the way they like it.